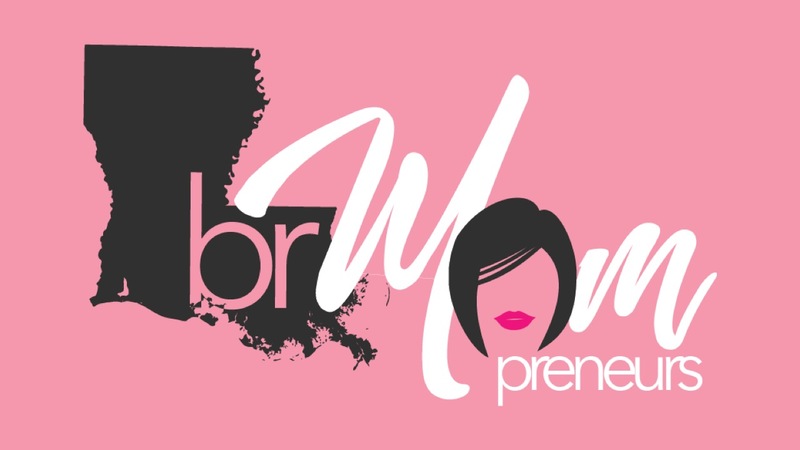 “Ask the Experts” is a series on Baton Rouge Moms where local experts share their thoughts, opinions and answer questions relating to health, wellness, parenting and living in Baton Rouge. This week on Ask the Experts, Smith Shanklin Sosa, fellow Baton Rouge parents, are sharing car seat and booster seat safety tips and laws. 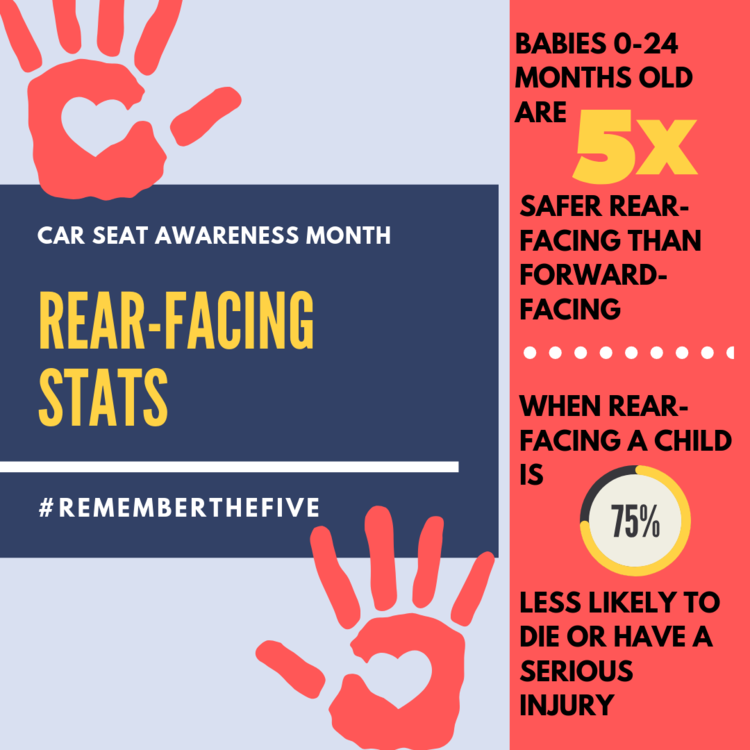 Be sure to check out the helpful printables that can be used at home, for babysitters, grandparents, or anyone that might need a car seat safety refresher. The best way to keep your child safe in the car is to use the right car seat in the right way. Smith Shanklin Sosa is also hosting a fabulous giveaway for a GRACO Extend2Fit® Convertible Car Seat below! Car seats have come a long way. In the past, they provided minimal protection and were only used for babies; toddlers and other young children simply used seat belts. Thanks to extensive studies on vehicular injuries and advancements in technology, car seats, and booster seats are now mainstays throughout early childhood. Choosing and installing car seats can be confusing, but understanding their basic features and functions will help. Children under the age of 1 should ride in rear-facing car seats. Louisiana law states that, due to the superior safety of this position in car accidents, children should be kept rear-facing until they are at least a year old or 20 pounds. However, safety experts recommend using rear-facing car seats until children outgrow them or are at least 2 years old. The next step is the forward-facing five-point harness option. Children should be kept in these car seats until they’re at least 4 years old or 40 pounds. 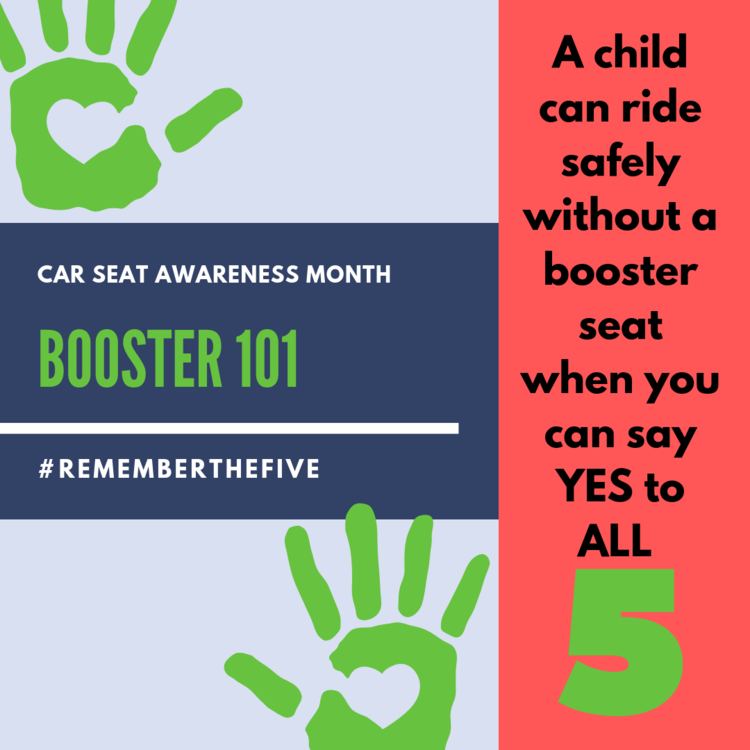 Then, booster seats should be used until children are tall enough to sit unassisted with seat belts safely crossing their shoulders and chests. Parents can choose between high-back and backless booster options. Typically, high-back boosters are used for younger children who don’t yet meet the height and weight requirements of a backless booster seat. These size restrictions should be clearly displayed on the packaging of all booster seats. – Convertible: These seats can be installed as both rear-facing and forward-facing to last until the booster stage. – Combination: Equipped with removable harnesses, combination car seats can be used as both forward-facing five-point harness seats and booster seats. – 3-in-1: The most advanced option on the market, these complete car seat solutions last until children are ready to use seatbelts. Each car seat has its own installation requirements, and their instruction manuals provide detailed directions. Car seats and some booster seats are installed using one of two systems, seat belts or lower anchors and tethers for children (LATCH). The LATCH system is available in most vehicles manufactured after September 1, 2002. LATCH systems should not be used when the combined weight of the child and the car seat exceed 65 pounds. For larger children or cars that do not have lower anchors, car seats can be secured by using the seat belt in a locked position. For parents who need assistance installing their car seats or want to make sure they’ve done it correctly, car seat inspections are available at local government facilities such as police stations, health departments, and fire stations. Learning about car seats and booster seats can simplify the process of choosing the right one for your child. Car seats are safer than they’ve ever been, but accidents can still happen. If you or your child has been hurt in a car accident, the attorneys at Smith Shanklin Sosa may be able to help. 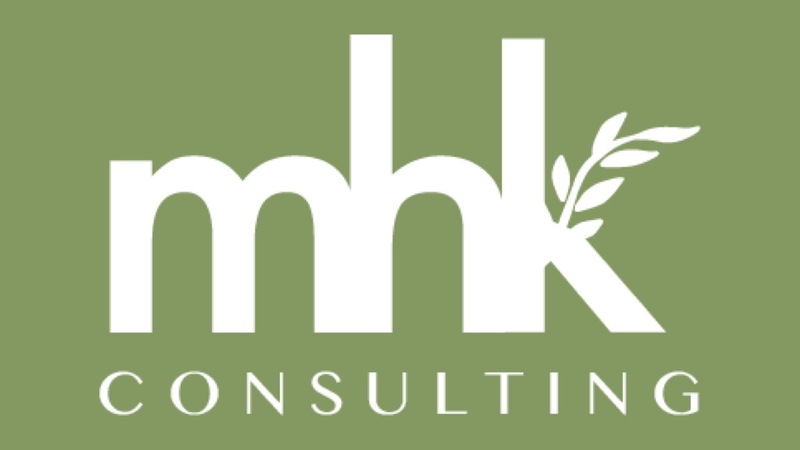 To schedule a free consultation, call them at 225-223-6333 or contact us online. 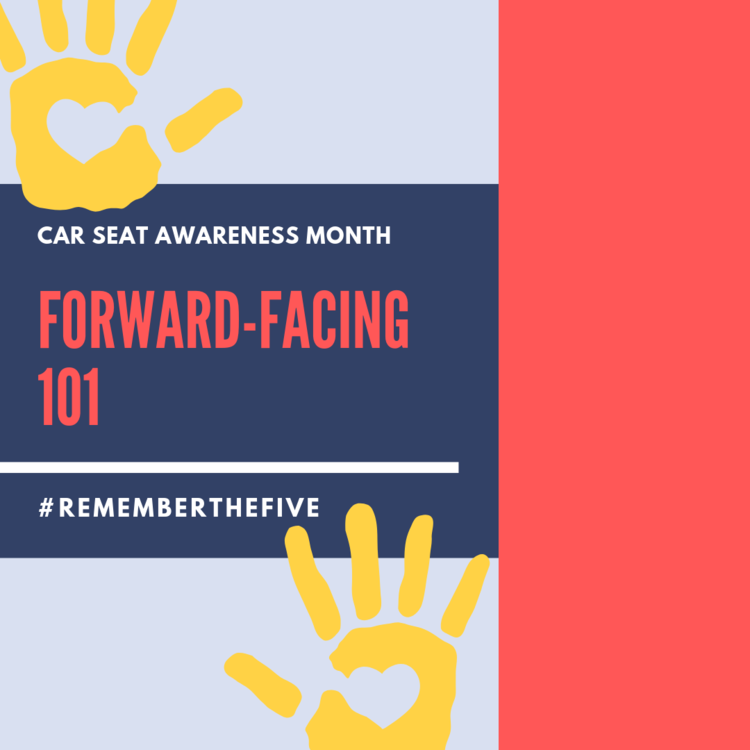 In honor of Car Seat Awareness Month, check out these helpful car seat & booster seat tips to ensure you are keeping your child safe! Click on the image for the full free printables! Smith Shanklin Sosa is hosting this giveaway for a GRACO Extend2Fit® Convertible Car Seat (Valued at $200) Simply enter via our Rafflecopter Giveaway Widget below with more entry option on our Facebook and Instagram pages! 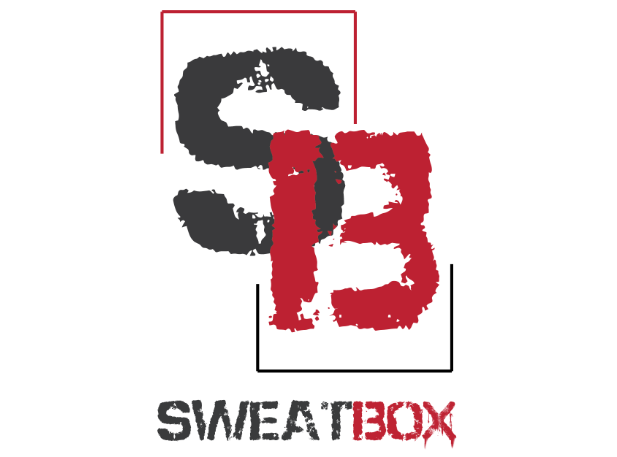 Disclaimer: The purpose of this site is to share BRM’s experiences with food, fitness, health, and life as well as opinions from some of our local experts. This content is for informational purposes only and isn’t a substitute for professional medical advice. When it comes to your health or the health of your child, please be sure to contact your physician. It’s a party!! BREC’s Baton Rouge Zoo is celebrating 49 wild years – complete with a birthday cake and fun for the whole family! Join the celebration at Zippity Zoo Fest, BREC’s annual spring festival, and birthday celebration! 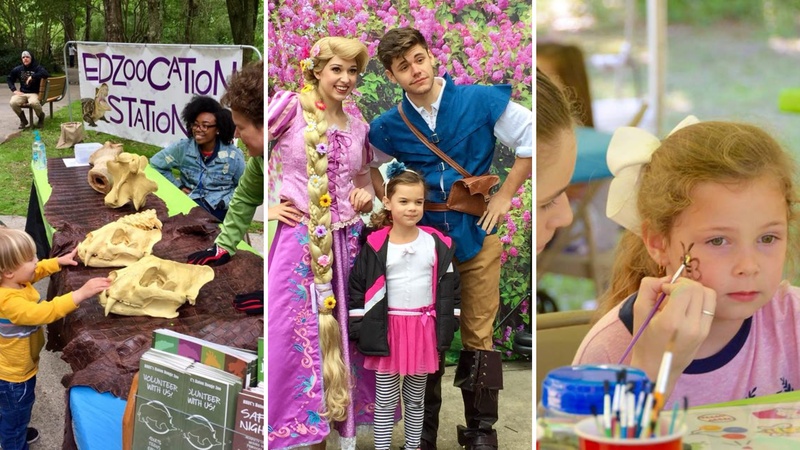 Families can enjoy a Children’s Village, Entertainment Stage, EdZoocation Station, Face Painting, Birthday Cake, Keeper Chats, and Special Animal Enrichments throughout the day! 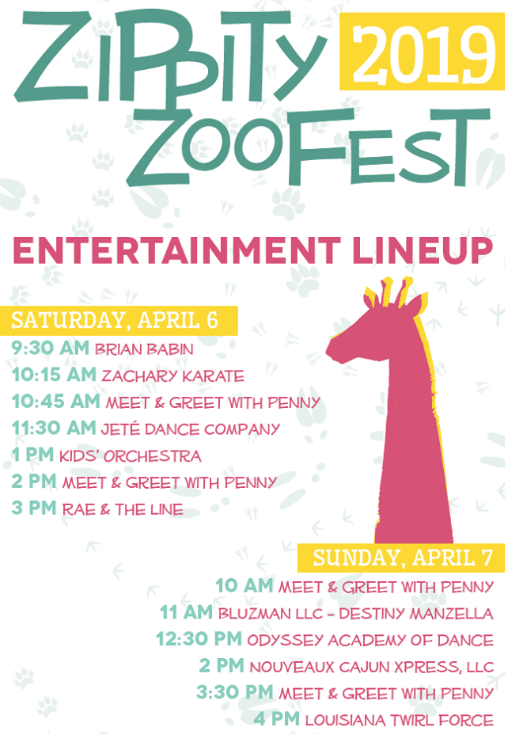 Zippity Zoo Fest will be held Saturday, Apr. 6 and Sunday, Apr. 7. from 9:30 a.m. to 5 p.m. Regular admission prices apply. ***GIVE BACK*** Support the Junior League of Baton Rouge’s Diaper Bank by bringing any unused, disposable diapers to Zippity Zoo Fest and be entered to WIN a Friends of the Zoo Household Membership! Our Capital One Pavilion is transformed this weekend into a free Children’s Village with giant inflatables! Parents watching their children can also enjoy the adjacent Entertainment Stage and seating area under the pavilion. Located next to our Children’s Village, enjoy the talents of groups from across the area, as well as local bands. If your band or group is interested in performing at Zippity Zoo Fest, please email membership@brzoo.org. Stop by the EdZooCation Station for fun and learning! 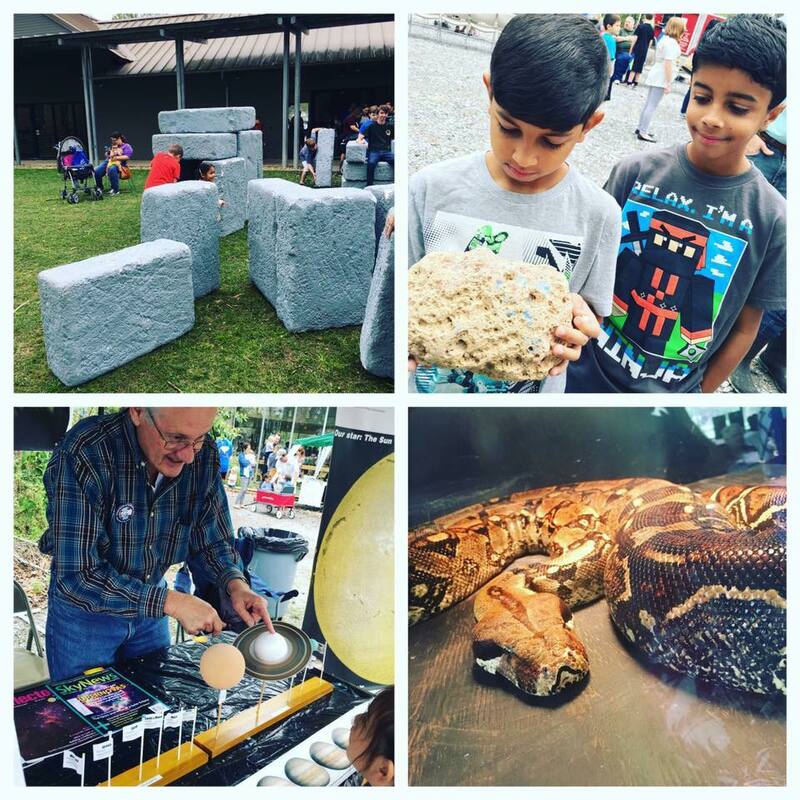 At EdZooCation Station, adults and children alike will enjoy a variety of interactive games to help learn about animal facts, animal conservation and pollination. You’ll also get to meet some of our education department’s animal ambassadors! Hear from our Zoo Keepers, ask questions and learn how we care for our animals daily. At select chats, watch our animals enjoy a special Zoo birthday treat, while you enjoy a piece of free Zoo birthday cake! What could be more fun than spending the day with tigers, bears and flamingos? Having one painted on your face! Visit our face painting station to experience the Zoo in style. $1 per face painting. Visit our education building (located toward the back of the Zoo, next to the Galapagos Tortoise/Flamingo Exhibit) to see the WINNERS of our photo contest. Sponsored by The Advocate, the photo contest is open to photographers of all ages and experience levels. Winners will be announced at Zippity Zoo Fest, and their printed photos will be on exhibit, gallery-style, throughout the 2-day event. We will also electronically display all photo submissions. Visit the Baton Rouge Chapter of American Association of Zoo Keeper (AAZK). This year at Zippity, AAZK is raising money for Bowling For Rhinos, their national philanthropy. Stop by to talk with our Zoo Keepers, learn about the amazing things they do for rhinos and take your chance at their ring toss game. $1 per try; all proceeds benefit AAZK philanthropy projects, continuing education and professional development. With the support of our partner organizations around the city, the Zoo will be filled with various activity booths! If your organization is interested in hosting an activity booth at Zippity Zoo Fest, please email info@brzoo.org. Rocks, crystals, and gemstones, oh my! Rockin’ at the Swamp has been a family favorite of ours for years. Our boys enjoy going to different learning stations, playing games, rock climbing, digging for shark teeth and playing with the giant stones! 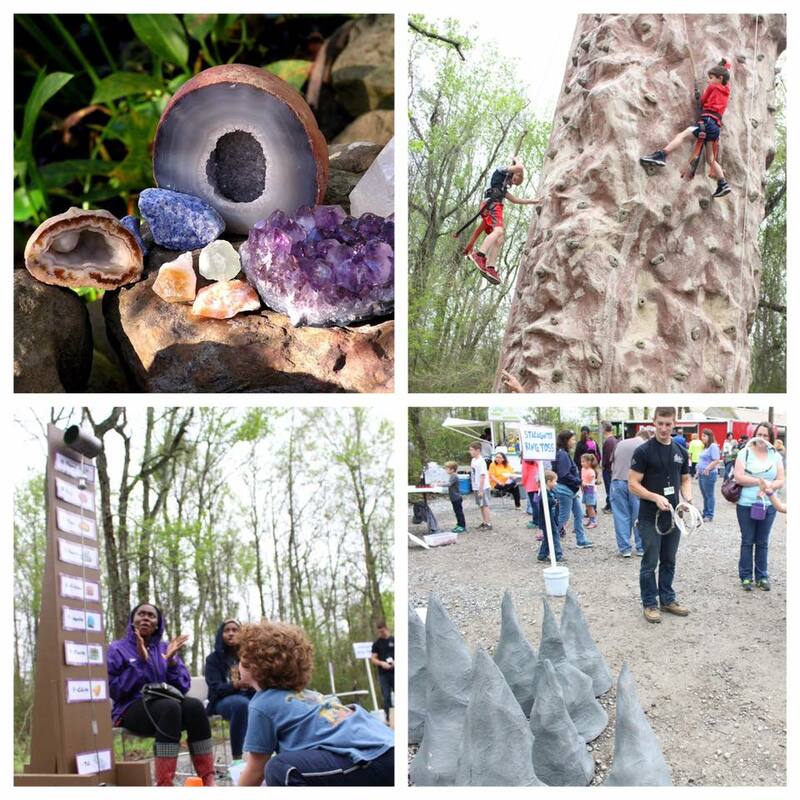 If you like nature’s earthly treasures, this event will rock your world! 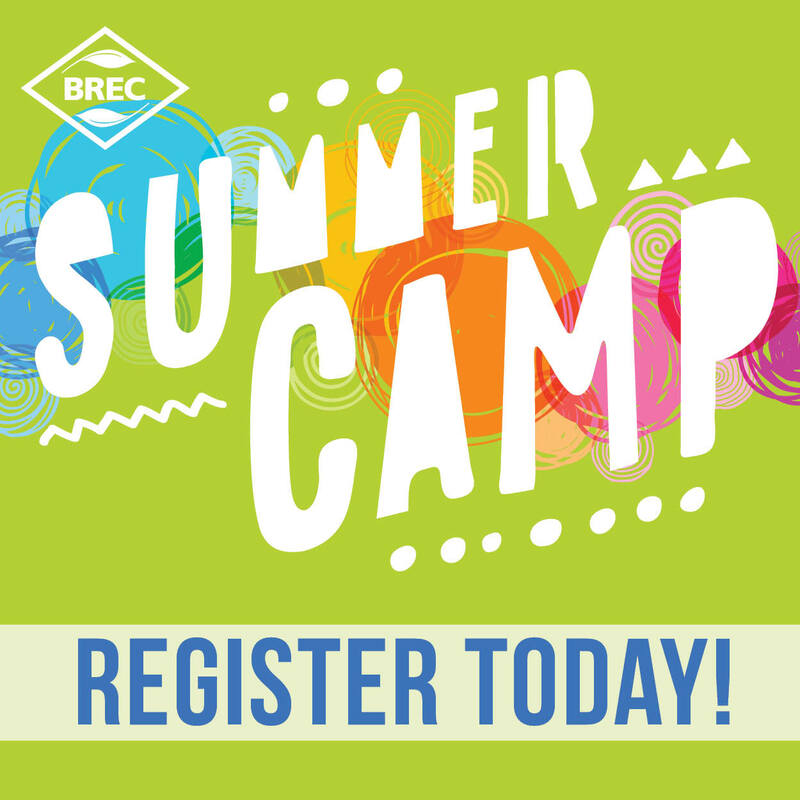 Join BREC’s Bluebonnet Swamp Nature Center to explore the world of rocks, minerals, gemstones, and fossils. Add to your rock collection or find some unique gift items at the Rockhound Market. Make your own rock & mineral identification card on the Treasure Trail. Try your skill scaling the rock-climbing wall. Experience the excitement of the gold rush while hunting for iron pyrite in our “Gold” Mine. Create your own “rock pet” in our Stone Craft Corner. Explore ancient life forms in the Fossil Quarry. This is one rockin’ day of fun highlighting geology and earth science that you won’t want to miss. Food and beverage purchases are available from on-site vendors. Thankfully, it looks like the rain is going to stay away and allow for a fun day of Rockin’ at the Swamp! We hope to see you there! The greatest gift we can give to our children is to instill a heart of giving, service, and empathy. All children are born with an innate sense of charity and compassion, it’s our job as parents to nurture it and empower the next generation of social good advocates. When P&G reached out with the opportunity to learn more about the power of clean with their water demonstration kit I knew it would be a perfect hands-on life lesson for my boys. With P&G’s help, I was able to offer our boys a glimpse of what children in developing countries must do to have clean drinking water. This hands-on experiment definitely lit a fire in our boys to make a difference for those in need of basic essentials such as clean water. Access to safe drinking water is a basic human right, however many are living without access to clean water. I’m excited to share that P&G is now selling the Purifier of Water packets to do this fun and educational activity at home with your families. By purchasing one P&G Purifier of Water packet, not only will your family take part in a fun and impactful experiment, but you will be donating 3 months’ worth of clean drinking water to a child in a developing country. 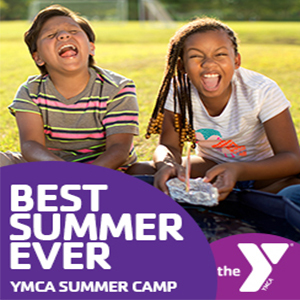 *For each set of packets purchased, $1.80 will be donated to the Children’s Safe Drinking Water Fund, which is a charitable fund managed by the Greater Cincinnati Foundation. For more information, please visit www.csdw.org. For more than 175 years, P&G has been devoted to developing cleaning innovation through brands such as Tide, Bounty, Swiffer, and Dawn. P&G scientists used the research behind laundry detergent to invent P&G Purifier of Water packets more than 15 years ago in partnership with the US Centers for Disease Control and Prevention. Nine billion liters of clean water have provided since September of 2015, helping to save tens of thousands of lives. With Spring Break around the corner, this would be the perfect memory-making activity to do with your kids and a great teaching tool to talk to your children about the clean drinking water crisis, the ability for science and technology to help in solving global issues, and the importance of giving to those in need. It’s a win-win and your children will never forget it! Check out this video of my boys doing the clean water experiment, the looks on their faces and their reactions as they see the P&G Purifier of Water packet at work is truly priceless. Raising caring children is often dependent on the kinds of experiences our children have. Experiencing the with our boys and learning about the program opened opportunities for a conversation on giving back and how little it takes to make a real, potentially life-saving, difference. Disclosure. I participated in a paid campaign on behalf of P&G and The Motherhood to share information about the P&G Children’s Safe Drinking Water Program. Contrary to popular belief, Mardi Gras can be family-friendly. The festival seems like it was made for children, with floats derived from the depths of the most ingenious imaginations, costumes, and masks that express unending creativity, bold colors, and joyous music abounds through parades. And, most importantly, the beads, doubloons and other treats thrown to the crowds from the floats are a child’s delight. It’s that time of year and we have your full Baton Rouge Mardi Gras Parade Schedule below! Please check the individual parade organizations’ websites for updated details. 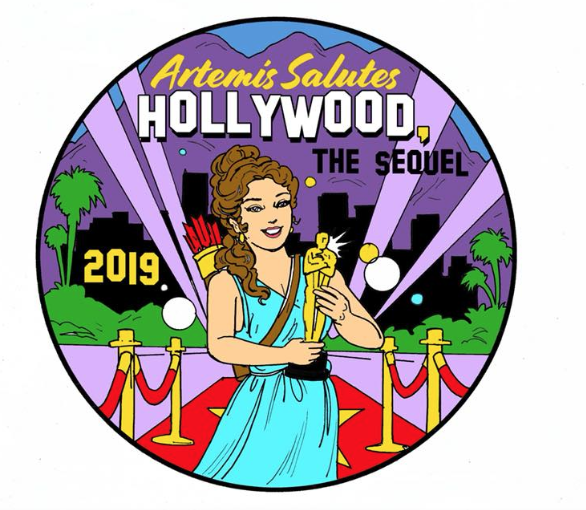 Join the excited revelers as they line the parade route while joining in the festivities and experiencing Baton Rouge Mardi Gras….Artemis style!! Revelers will be treated with themed throws, including the Krewe of Artemis’ signature High Heeled Shoe, along with footballs, tambourines, stuffed animals, float beads and lighted throws. Parade begins and ends at the corner of Government Street and St. Philip Street. 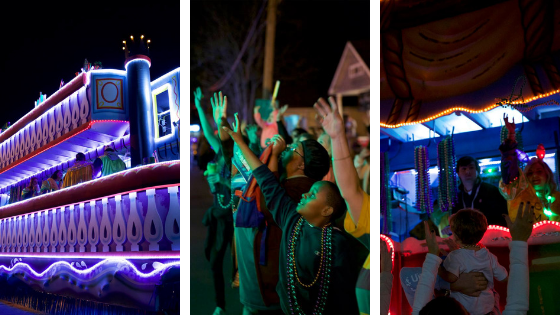 The Krewe of Orion’s 20th annual Mardi Gras parade in downtown Baton Rouge will take place on February 23, 2019, at 6:30 PM. Parade goers will be treated to a line of exciting, colorfully-lighted, and tractor-pulled floats. The floats will be decorated to depict this year’s theme. 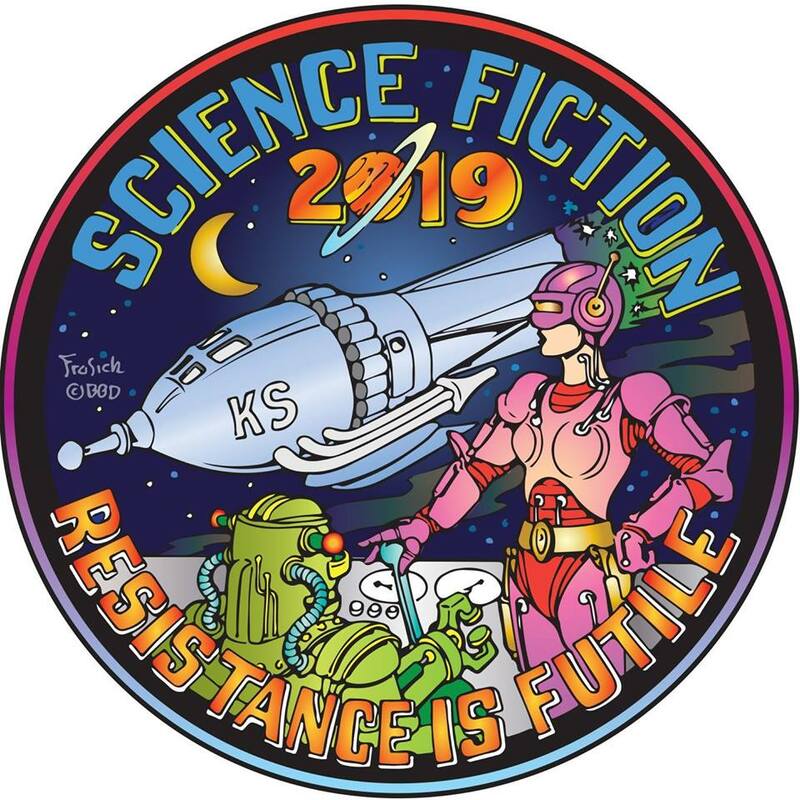 On the floats, masked and costumed riders will throw plenty of themed parade medallions, Krewe of Orion signature footballs, cups, plush items, Orion doubloons, lighted throws, and beads. Marching bands, dance groups, and marching units will be among the great sights and sounds at this wonderful family-oriented parade. Visit the website for more information https://kreweoforion.com/parade/. 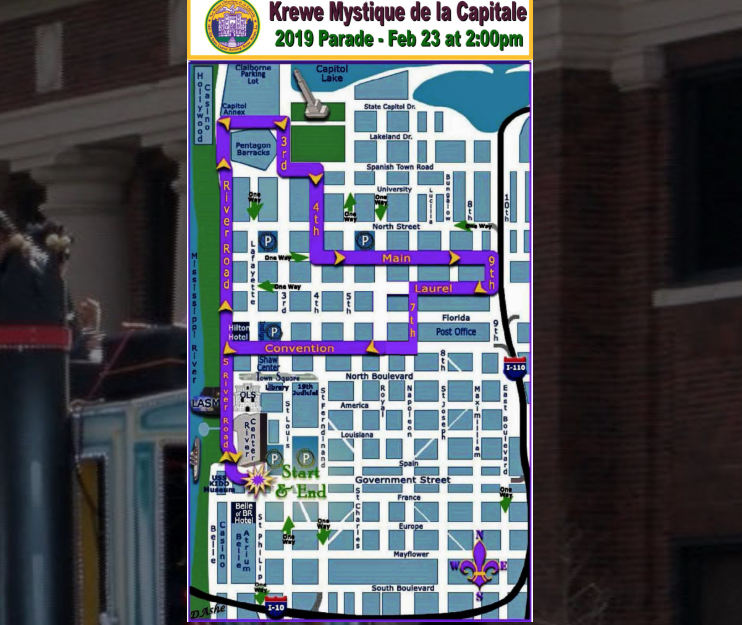 The Krewe of Mystique de la Capitale welcomes you to the 2019 Mardi Gras Parade as they celebrate 41 years of parading in Louisiana’s capital city. They are the city’s oldest parading Mardi Gras Krewe and we’ve shared 41 wonderful years of carnival fun in Baton Rouge. Enjoy plenty of floats, marching bands, dancing groups and, of course, Throws!! They will roll at 2pm beginning near the Canes Rivercenter and proceed down River Road before our trip through downtown! 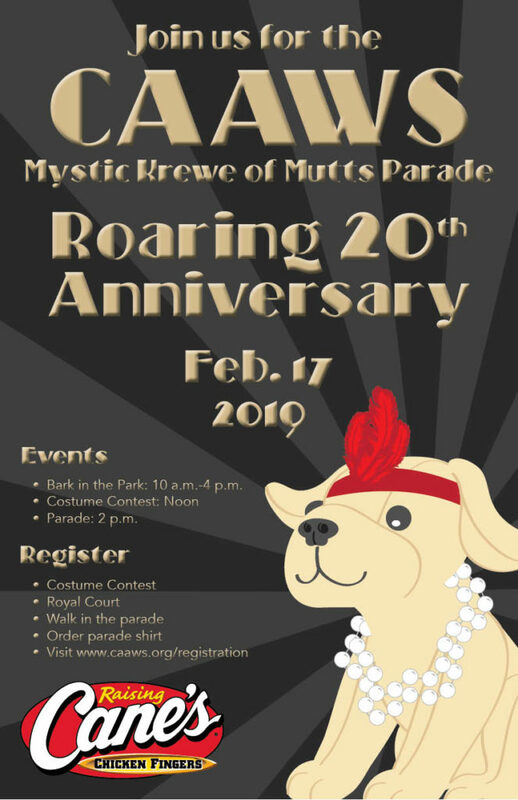 Join CAAWS for “The Roaring 20th Anniversary” of the CAAWS Mystic Krewe of Mutts Parade on Sunday, Feb. 17, from 10 a.m. to 4 p.m. in downtown Baton Rouge! There will be Bark in the Park, an EBRP K9 Demo, Dog Costume Contest, Parade, and After Pawty at Raising Cane’s on Third Street! 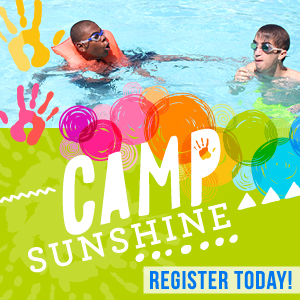 For more details or to register for activities, visit www.caaws.org/registration. 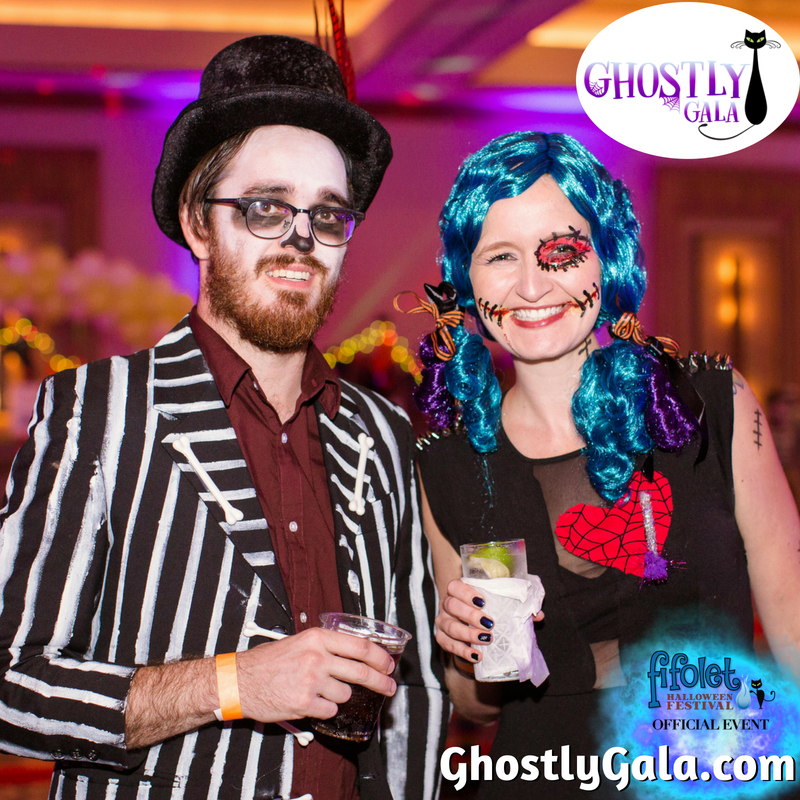 Register online before parade with code 20YEARS and receive 10% off registration! Interested vendors may sign up at www.caaws.org/vendor or email barkinthepark.caaws@gmail.com. FOR SAFETY PURPOSES, NO RETRACTABLE LEASHES ARE ALLOWED, NOR ANY LEASHES LONGER THAN 6′. Your dog should have a proof of current rabies vaccination tag. No puppies under 12 weeks, aggressive dogs, or dogs in heat are allowed. The west side’s only nighttime parade. 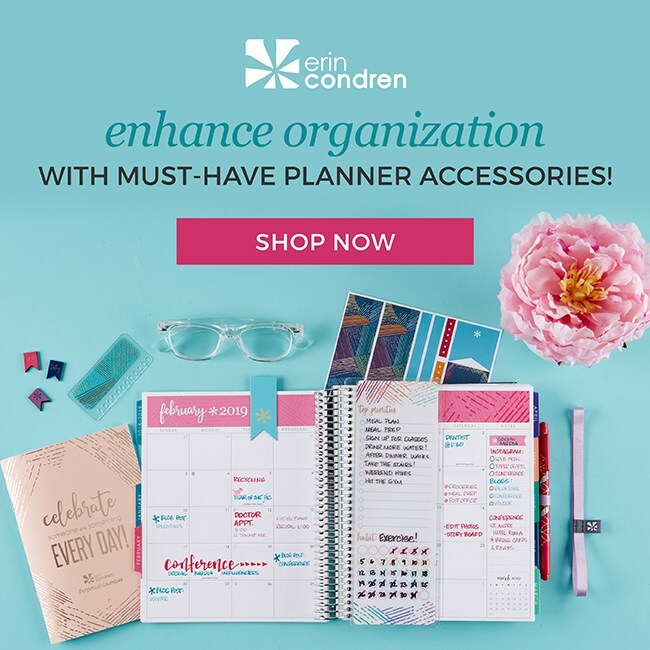 Lighted throws, street parties, family fun! The 35th Krewe of Good Friends of the Oaks Mardi Gras parade will begin and end at the corner of the LA-1 Service Rd and Oaks Ave. The parade route is as follows: east on Oaks Ave to Jefferson Ave, north on Jefferson Ave to Court St, west on Court St to Sixth St, north on Sixth St to Louisiana Ave, east on Louisiana Ave to Jefferson Ave, south on Jefferson Ave to Oaks Ave, west on Oaks Ave to LA-1 Service Rd. 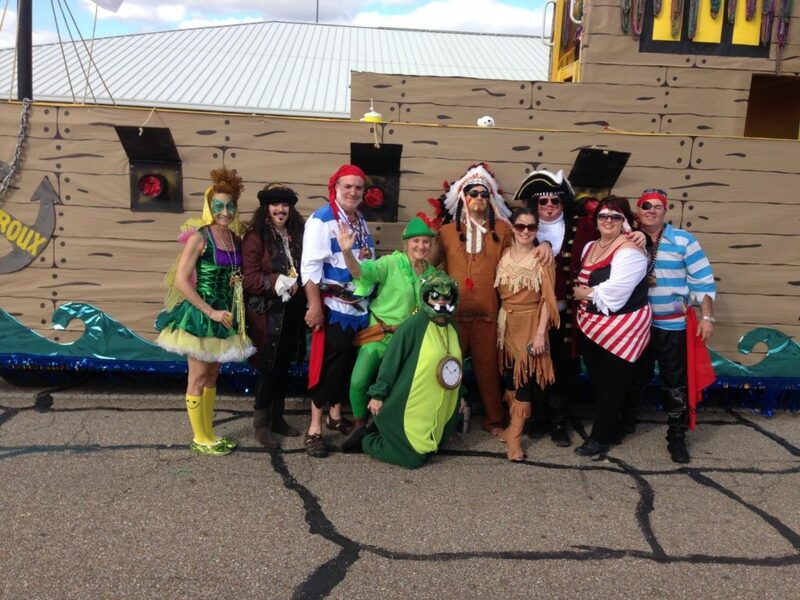 Mardi Gras season is upon us and we are looking forward to another great year. Our parade will take place on February 23rd. Come out and meet our King and Queen. We are excited to have our signature throws again this year, King Cakes. The Addis Volunteer Fire Department Mardi Gras Parade is held this year on Saturday, February 23, 2019 in Addis. The Krewe of Good Friends Parade is held the Sunday, March 3, 2019 in Port Allen. Free Family Friendly Annual Mardi Gras Festival held in North Blvd Town Square, Downtown Baton Rouge. Enjoy a whole day of live music, art, and great food. The event will showcase live bands and Krewes, with a Vendor Village, art exhibits, food and more. Concerts, Mardi Gras parades! Fabulous Flambeau Food Court & Beverage Zones, Kid-friendly activities, an Art Market and more. 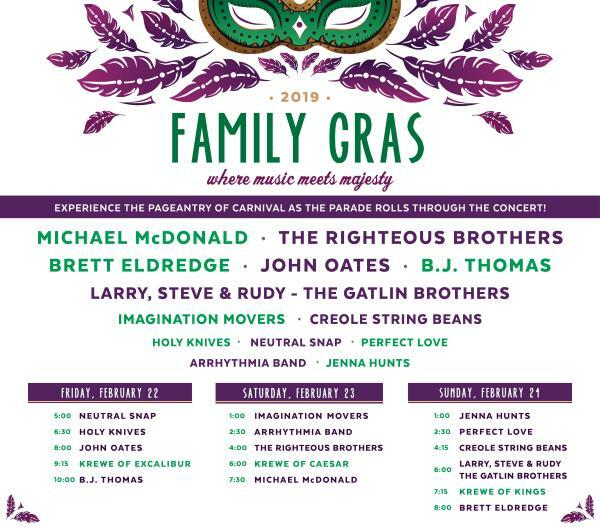 Family Gras is the perfect getaway for family. A FREE event, Family Gras traditionally takes place on the neutral ground (median) of Veterans Memorial Boulevard across from Lakeside Shopping Center in Metairie, Louisiana. An ideal location to see the pageantry of Mardi Gras and enjoy the outdoor concerts by national & local artists on the Mardi Gras Plaza stage. Shop the Art Market filled with a variety of items from Louisiana photography, framed artwork, regional decor, folkart, hair accessories, to hand-crafted jewelry. The kids court is filled with activities for kids 12 and younger. Face painting, unique hand-wax art, and interactive games. 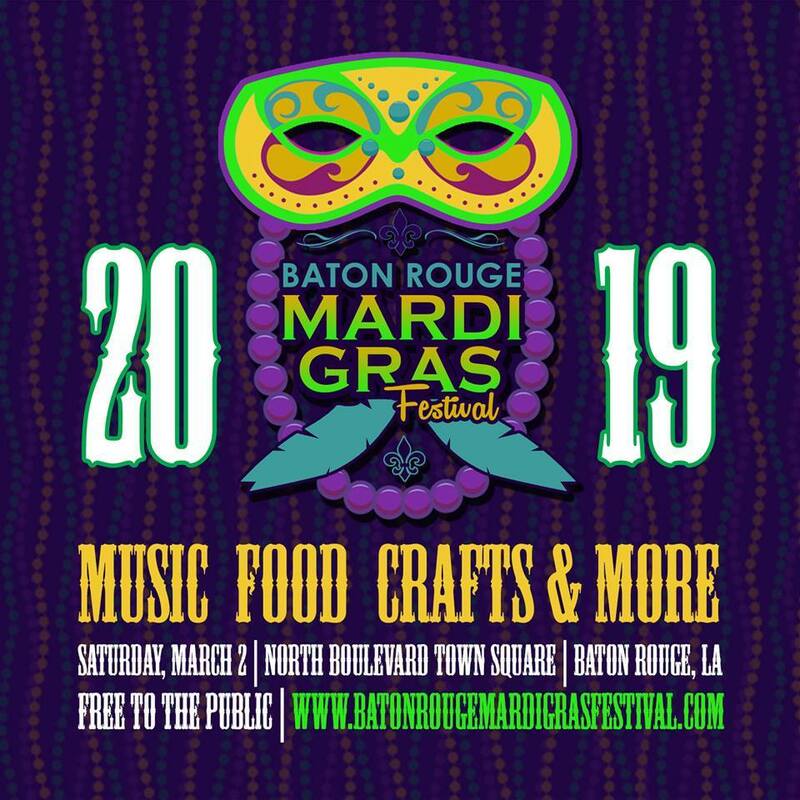 With past performances by Frankie Valli and the Four Season, Tony Orlando, the Pointer Sisters, Blood Sweat & Tears, Zack Brown Band, The Monkees, Leann Rimes, Tito Jackson, Becky G., Jesse McCartney, The Imagination Movers and so many more you know Family Gras offers such a variety of talent each year the entire family can enjoy! If you are new to Louisiana, the only place you should avoid with kids is the French Quarter. It’s best to see the parades when they begin on St. Charles Avenue near Napoleon, since parades can go on well into the night by the end of the parade route. The Garden District are of St. Charles is also family area where you will see many families enjoying the day and planting themselves to see the parades. On Fat Tuesday, visitors are encouraged to join the local tradition of masking. Zulu, an African American parade, leads the long day of parades on Fat Tuesday, Mardi Gras itself. Children scramble for the much-desired coconuts handed down by float riders. 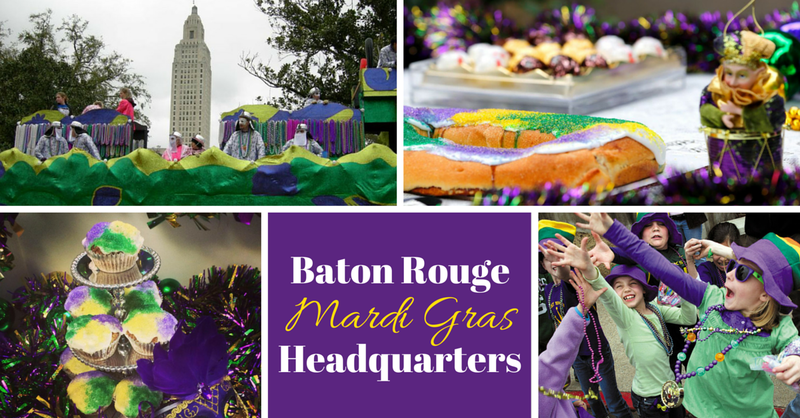 Baton Rouge Moms is your Mardi Gras Headquarters! 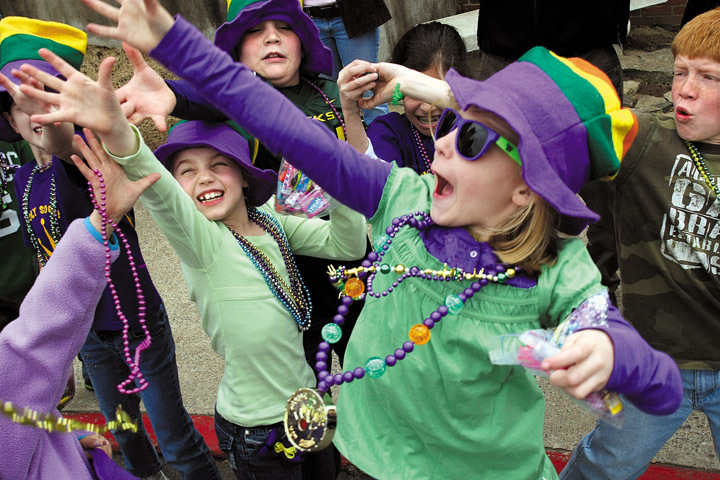 View our comprehensive Family Friendly Mardi Gras Guide HERE!! Louisiana State University fans, I see you with your LSU kids. They’re rocking purple and gold jerseys, clutching Mike the Tiger dolls in chubby fists, humming Fight for LSU from memory. Way to go with the indoctrination! If luck holds out, your little ones will grow into fine LSU students. It’s many a parent’s dream that their child matriculate at a certain university. Still, even if they rebel and choose a school full of students who yell Roll Tide, the message about higher education can get through at an early age. Including children in specific collegiate traditions is a great way to help them understand the greatness that can be the college experience. 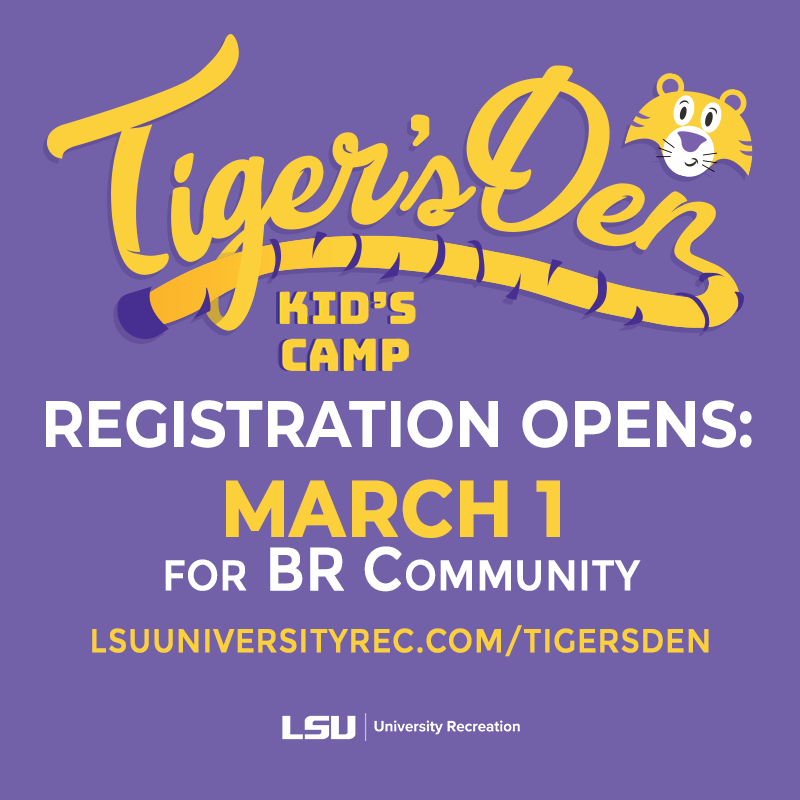 Raising Kids Who Yell GEAUX TIGERS! Read, read, read – books about college. So you’re tired of slogging through that newborn board book that features colors? Try a college-themed tome instead. “See Mike?” “Mike the Tiger is orange.” -You get the picture, pun intended. 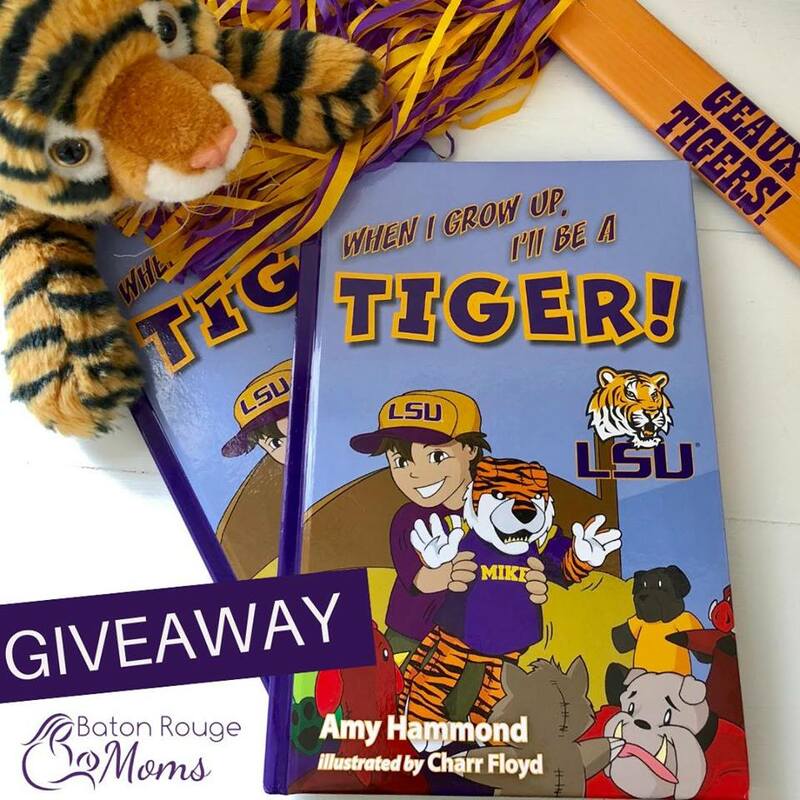 Early elementary-aged kids can recite the couplets in When I Grow Up, I’ll be a Tiger; purchase a book about LSU history for your middle or high school-aged student. Remember that Saturdays are not just for football. Sure, take your child to campus decked out in his gameday best. Also, take an hour to walk around beforehand and explain where Daddy or Mommy took their favorite classes and why this place is so absolutely incredible. Make it clear to a child that college is where many people receive training to become what they want to be. Personalize this opportunity for the child; if he loves math, for example, explain that at college he may take math courses galore. Back to football. A huge part of the college experience is sports, so if your child seems game, grab that year’s media guide and discuss this year’s squad. Is your little lady more interested in outrunning all the other kids on the playground? Request a cross-country media guide instead. Good luck inspiring the next generation! Introduce higher education to children through your favorite college, watch the allegiance grow, and cross your fingers. Hopefully, they’ll choose your alma mater. And if not – at least you tried. Enter to win one of TWO copies of When I Grow Up, I’ll be a Tiger on our Facebook and Instagram pages! 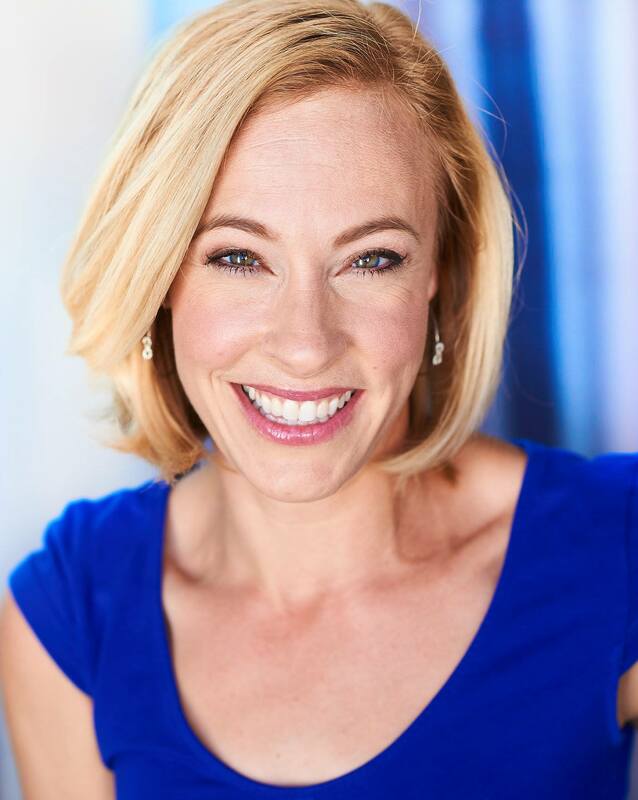 Amy Hammond believes all children should set their sights on college greatness. The author of When I Grow Up, I’ll be a Tiger, When I Grow Up, I’ll Be a Gator, When I Grow Up, I’ll Be a ‘Nole, When I Grow Up, I’ll Be a Bull and When I Grow Up, I’m Bama Bound has been an LSU fan for as long as she can remember. Her books can be purchased online here, at campus bookstores and various retailers; to purchase signed copies, email her at amyz916@yahoo.com. 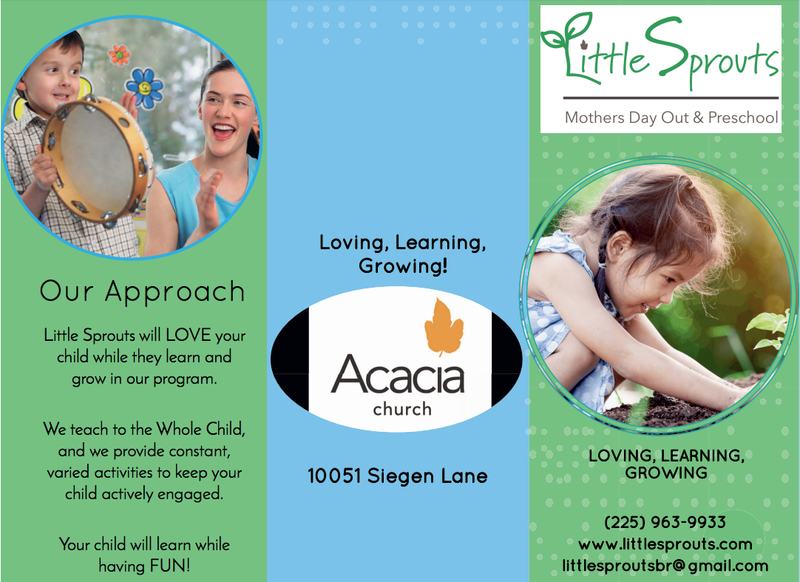 Mother’s Day Out – Little Sprouts Open House – where fun and learning meet! There are times during the week when moms can use a little help and time to get things done. 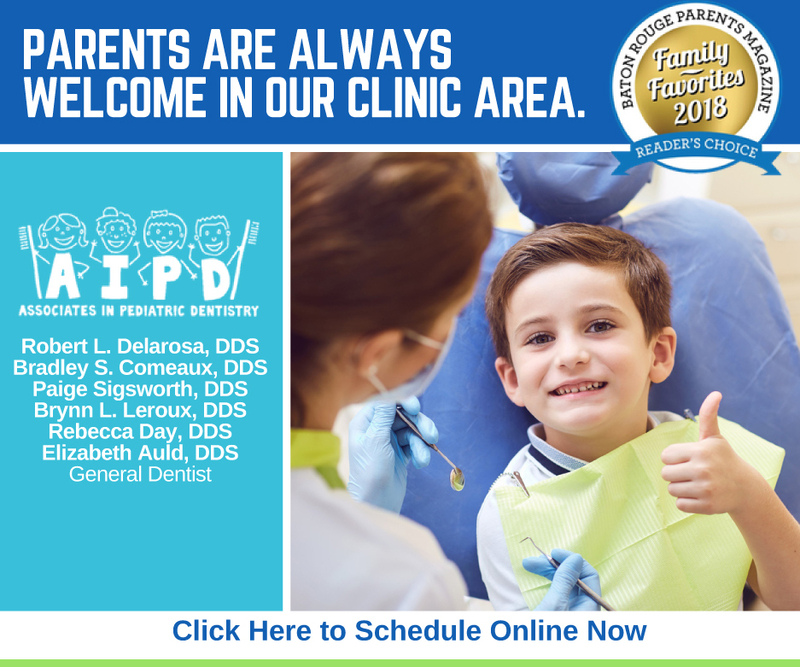 Mother’s Day Out programs can be the perfect option when you need a little “me time” or when you want to quickly and efficiently tackle the tasks on your busy schedule. Mother’s Day Out also gives your child the chance to interact, have fun and learn in a safe and friendly environment. It’s easy for us to feel guilty about dropping off our children at a Mother’s Day Out, we worry about leaving them in caring hands. There’s a new Mother’s Day Out option in Baton Rouge, Little Sprouts, where fun and learning meet! You can rest assured that Little Sprouts will provide an environment that is beneficial and nurturing, where your little ones love, learn and grow! On August 15th, Little Sprouts will host an open house tour of their facility for interested parents. Little Sprouts will start September 4th, Monday through Friday from 8:30 to 12:30. 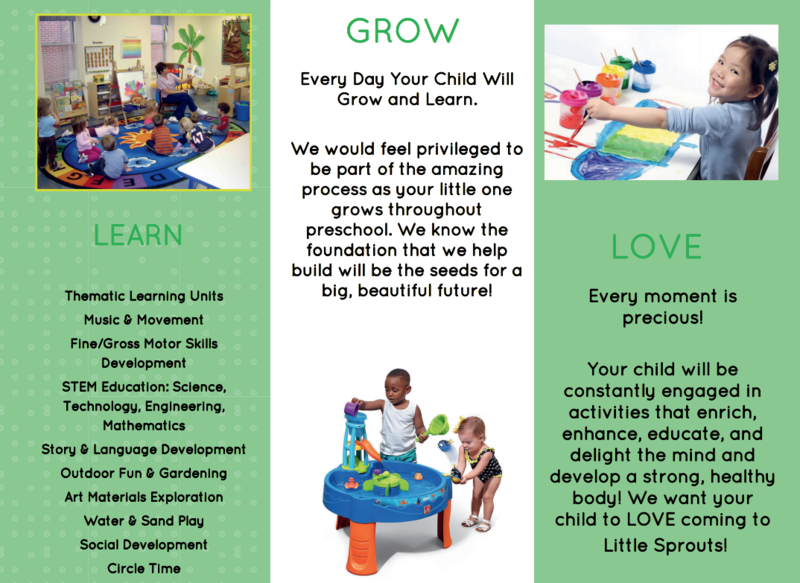 Little Sprouts provides first-rate preschool experiences to children ages 2-5 and prepares them for Kindergarten. Whole Child Education includes academics, social skills, fine motor skills, gross motor skills, music and lots of hands-on activities to learn about them all! Parents have the option of choosing 2, 3 and 5 day Mother’s Day Out. 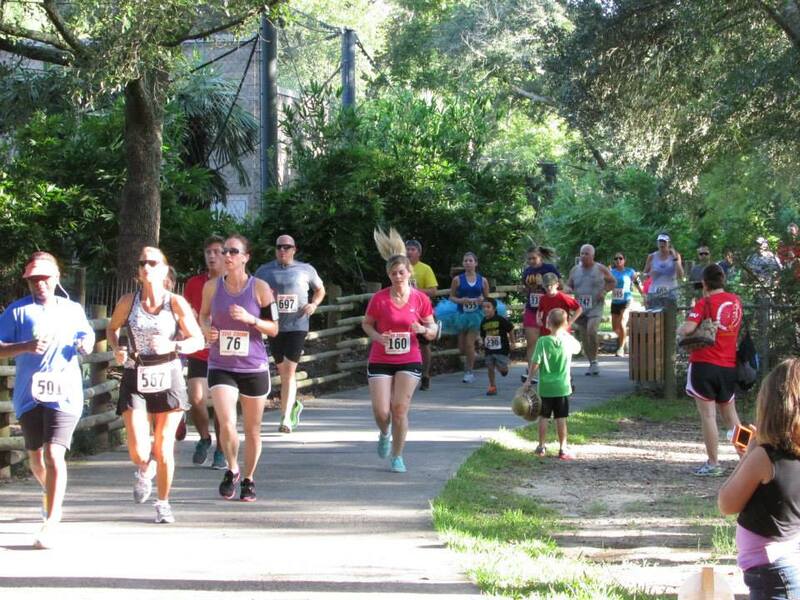 Whether you are a turtle or a hare there is fun for all to be had at the Baton Rouge Zoo’s 13th annual Family Zoo Run Run 5K and Fun Run on August 25th. You are welcome to come aim for that exclusive Ostrich Egg award for first place, try out your creative skills to run in an animal-themed costume or enjoy some post-race animal crackers. It’s sure to be a wild time. Where else do you get to run alongside cheetahs, elephants, monkeys and more? Come join the Fun! Participants can enjoy refreshments for the whole family after the race in our Capital One Pavilion area. As well, any supporter in a participant’s party gains free admission to the Zoo after the race, so you can make a family day after the race! All pre-registered participants will receive a Zoo Run Run T-Shirt on Race Day as well. 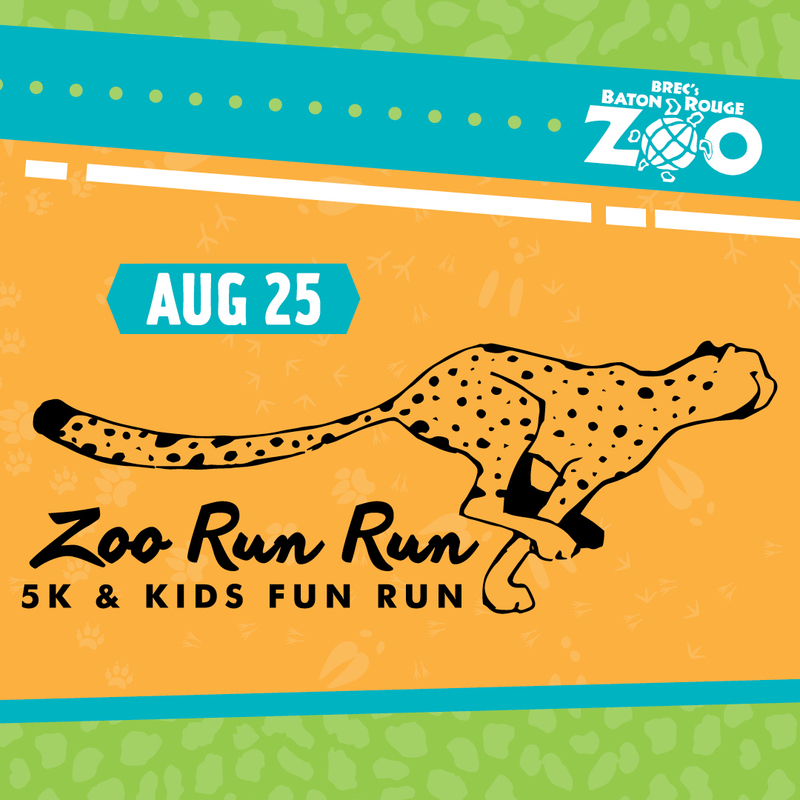 You can pre-register at http://www.brzoo.org/events/special/zoo-run-run/. You can register on race day at the event near the front entrance of the Zoo starting at 6:30am. All proceeds from the event support BREC’s Baton Rouge Zoo and international cheetah conservation efforts. We encourage our entire community to come out for this one-of-a-kind outdoor experience at the Zoo. So, run like a cheetah and get pre-registered today! Fun Run begins at 7:45 a.m.
5K begins at 8:15 a.m.
Race day registration will be located at the front entrance of the Zoo. Located just 15 minutes from downtown Baton Rouge, take Exit 8A off of I-110 North and turn right onto Highway 19. Continue to the second stop light and turn right onto Thomas Road. The Zoo entrance is one mile on the left. Only 5K runners will be timed. Your RFID timing chip will be attached to your race bib. Participants who are pre-registered by August 15th are guaranteed a Zoo Run Run t-shirt on Race Day. 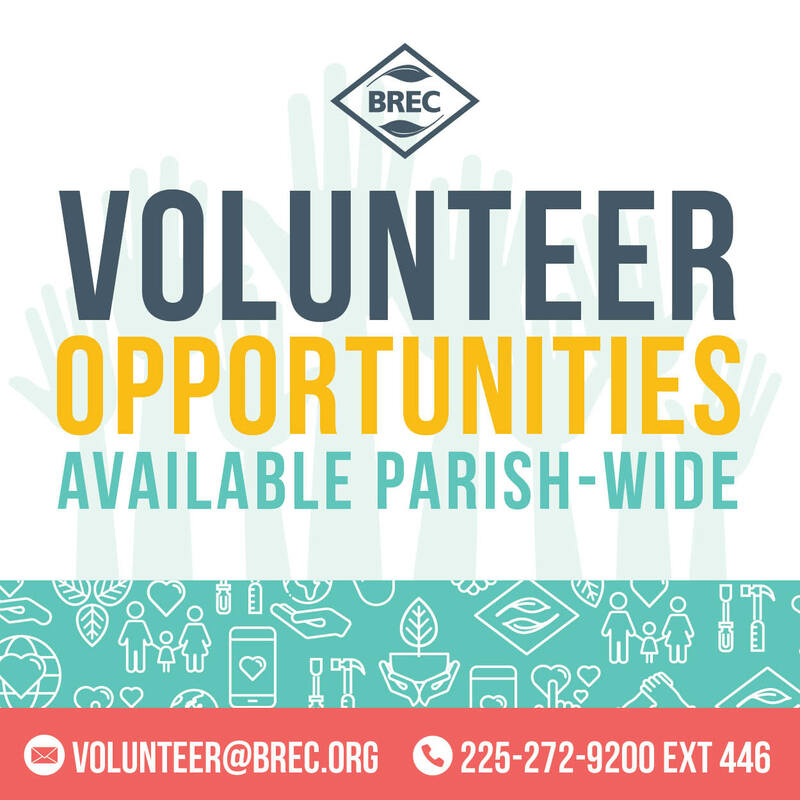 For questions or to volunteer, please call (225) 775-3877 or email info@brzoo.org. Flock on down and join the herd for a great event for competitive and casual runners, walkers, and families alike, all for a great cause. We hope to see you there!